Yeast-Free Pizza Dough: Fast and simple recipe for Pizza Dough made without yeast that is delicious and SO easy to make! Besides… ain’t nobody got time for that dough to rise. Oh, look at that! It’s Monday. Already! Happy start to the week, friends! I worked super hard these past few days. Okay, that’s a lie. My husband worked. I watched. I dislike (read: hate) yard work. It’s too, um, dirty. And hot. And there’s bugs out there. My punishment for not helping? Sunburn! I thought I was all in the shade, but somehow, those rays went straight through the tree branches and decided to take up space on my lovely shoulders. Thus, to make Monday-matters a bit awesome, I thought we should bring a little Friday to our Monday. Like, serve pizza for dinner. Homemade pizza. Like, completely from scratch…like. This is the yeast free pizza dough that made those Grilled BBQ Chicken Pizzas crazy-delicious! This, by far, is the best pizza dough I’ve made to date. True story. I’m always trying new ways to improve on basic things. Things such as gluten free cakes and BLT sandwiches. You know… the basics. And in all those attempts, there’s one thing that I will never stop trying to make better: Pizza Dough. That’s my husband’s fault: this pizza crust is too thin, this one is too thick, this is too crunchy, this is too soft… Lawd, shush up! Surprisingly, he found nothing wrong with this yeast free pizza dough. Nah.thing. The guy just ate his pizza, commented that the dough was awesome, and there were zero complaints. Hallelujah! In case you didn’t know, flour seems like a simple and obvious addition to any pizza dough. As does water. Also add in some salt, baking powder, and canola oil. That is all. If you feel inclined to add a bit of garlic powder or herbs, I understand. Just do it. Just let this happen. I swear it will be the best pizza you’ve ever had. Pile everything delicious on top of the dough and call it dinner. 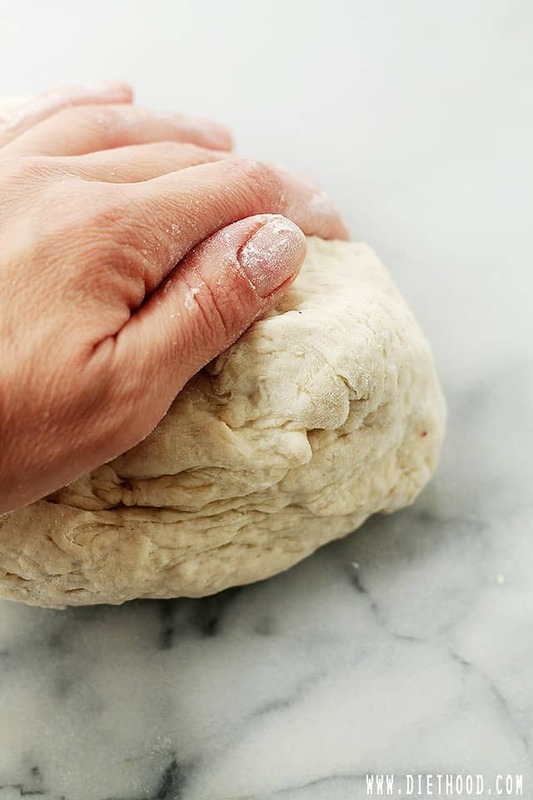 Fast and simple recipe for Pizza Dough made without yeast that is delicious and SO easy to make! Lightly flour your work area and knead dough for 5 minutes. Line a baking sheet or a pizza pan with foil and lightly spray it with cooking spray. Spread pizza dough on the prepared pan, using the palm of your hands and fingers to stretch it out to about a 1-inch thickness. Grill or bake in a 400-degree oven for 15 to 20 minutes, or until lightly browned. Hello…i love the crust as well…but has anyone ever made the dough, rolled it out, cover with syran wrap then keep in fridge to bake later that day? I actually wanted to make a dough with yeast, but since I waited so long to go to the grocery store… I needed something quick and easy! The place that I’m currently petsitting at has a pizza stone! I was so excited, unfortunately since this is a thin pizza dough I had to use half the amount I made rather than a fourth. I tried spreading it out as evenly as possible, and I got a few doughy spots and the areas that weren’t doughy kind of reminded me of store-bought dough. I think that next time if I add some rosemary infused olive oil to the dough, pre-bake it a little, and allow it to char a bit next time I might have better results. It was still really good for a dough that I whipped up in about 10 minutes! I didn’t have time to make homemade pizza sauce so I just used prego and added Parmesan, fresh mozzarella, ricotta, spinach, mushrooms and after I baked it through I added avocado and a touch of sea salt. The sea salt really made it! Do we need to puncture the dough prepared with fork before putting it in an oven? am i able to use veg oil instead of canola and what would the amount be? Vegtable oil and canola oil are really the same thing. Just use the same amount! Not sure where you got your calorie calculation from because this works out to be just under 300cal per serve. Double what you have written on your recipe. Whenever I look up recipes that are usually just for reference and I never ever comment but holy smokes this is the best pizza dough I’ve ever had yeast or no yeast. I am a thin pizza kind of girl so this is heavenly for me. I made a few tweaks with the water and oil but I looked this up almost a month ago and I’ve been eating pizza almost every single day since then. Try taking out the salt and baking powder and instead of all purpose flour use self rising. I have made so many no yeast pizzas, like, it’s kind of a staple in our house. But I’d lost and forgotten my recipe. So today I came across yours and, these are the best pizzas I have ever made, they tasted so good I amazed myself with how great my cooking was. I did turn the one dough into two, just because I prefer thinner bases, but honestly, this recipe is ridiculous. Even just the preparation of the dough, it was silky and puffy and soft, a really enjoyable experience, and I found I didn’t need to add any water of flour to get the right balance, it was just already perfect. I added the water/oil mixture really slowly, while stirring, possibly people have poured it in too fast and that might have resulted in the dough being wrong, I’ve done that before and it goes clunky hard and wet and unrollable. And definitely fresh baking powder is important, that can have a big effect. This recipe is so good!!!!!!!!!!!! It says to roll out to 1” that’s sound thick. Is that correct? That didn’t make sense to me. I rolled it out much thinner, and it ends up about 3 times as thick once it’s cooked. If I do it again I’ll make it as thin as possible so the end product isn’t too thick. This was really awesome since I didn’t have any yeast to work with. Had to add more water, and didn’t pre cool since I was making pizza balls and needed to shape the dough around the filling. Really awesome and great vegan recipe. I had to add a lot more flour to get it to be less sticky. Maybe it’s because I used avocado oil instead or maybe I misread the water amount. Anyway, like some of the other reviewers, it came out like a biscuit. That’s not a bad thing, but I do wish I’d pressed out the dough more as the dough to toppings ratio was over balanced in the dough’s favor (with it being at an inch). On its own it isn’t too bland but it isn’t that flavorful either. I think I’ll add a baste next time. HI, I want to try this but for a calzone. I wouldn’t precook the dough in that case, correct? Just flip it I would think. Your suggestion.. I haven’t made calzones with this dough recipe (great idea!! ), but yeah, you don’t have to precook it. Calzones take about 15 to 17 minutes to bake, and that is enough time for everything to cook together. I give this recipe 4.5 stars. I made this because I didn’t have yeast. This is an excellent alternative for sure! It wasn’t hard like some reviews. The inside was more like a biscuit in texture. I added a little bit of garlic powder to be safe because some reviews made me nervous that it came out bland. Now I don’t think it was really necessary. I didn’t follow the time or temperature fully because I knew it wouldn’t work with my oven. I preheated at 400 but lowered it to 375 so it could cook the suggested time. Next time I’ll lower the amount of salt to 1/2 tsp. It wasn’t too salty, but it was prominent to my liking. Made this last night when I realized I was out of yeast. It turned out great. The only thing I was confused about, as it doesn’t say in the actual recipe (though now I see some comments), is if you precook the crust before adding toppings. It would be awesome if you could update the instructions to include that. But having plenty of experience in making pizza, I did precook it. I was worried it was going to be dense and it totally wasn’t. This will definitely be on my rotation for quick and easy pizza. Thanks. Hi! 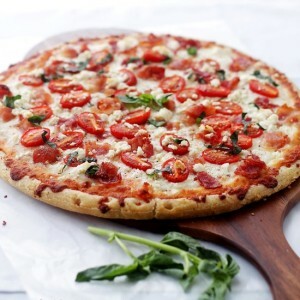 I tried making this but unfortunately my dough didn’t become stretchy like pizza dough normally does when you kneed it. Do you have any tips? This was my first time making aby kind of dough! It tasted great just was more flaky than a smooth pizza dough? Not sure what I did wrong. Thank you! You may have added too much too much flour, I’ve made that mistake. I added more water to the food to make it stretch. Knead the water in the of you feel that the dough it too sticky add flour. This was amazing! I used olive oil instead of canola oil only because I didn’t have any canola. I made my boyfriend and I four mini pizzas with this recipe but it could’ve made two regular sized pizzas. I rolled it out pretty thin and it came out perfectly after 15 minutes! Not squishy or crunchy or anything. It was the easiest recipe. Definitely going to be a regular one now! Okay, already have dinner planned for tonight, but this is for tomorrow. I’ve been on a gluten free diet for years and recently found out that it’s not the wheat that I’m allergic to, it’s the yeast and also eggs! Tomorrow night, it’s going to be pizza! Will try to find you again so I can tell you how it went! Thank you!!! How did you find out you were allergic to yeast and eggs? My daughter has been suffering with egg allergy that doesn’t actually show up on an allergy test. Can you please recommend a way to test for yeast sensitivity or allergy? Thanks so much. I am also allergic to eggs and have a brewers yeast intolerance. The only real way to know is to do an elimination diet. I found that high yeast things like bagels and pizza crust (with yeast) are the worst. I also got a lot of anxiety from a multivitamin with high B complex, then discovered B vitamins come from brewer’s yeast.Artificial sweeteners are a problem (stevia is ok) as well as many batters coating things. Anything with vinegar, like catsup and salad dressings, should be eliminated. If she goes without these for a week, I think it might be a good indicator if she feels better. Sharon, I order flour from Italy. I found that it isn’t wheat for me, its American factory farmed wheat (and many “American food industry” other foods, too). I can’t eat any American bread, but imported French bread is a blessing. I can’t order pizza from a delivery place, but I make amazing pizzas from imported Italian flour, tomatoes, olive oil and fresh produce from my yard. I am ok with grass fed free range beef, but a cut from the grocer makes me sick, literally. Anyway, be careful with over processed “gluten free” stuff, some of it resembles nothing in nature…lol. Try some imported Italian or European flour… it’s delicious! Hi! I am very excited to try this dough and i read about the freezing but i am confused on the individual balls? i break up one batch into multiple balls or can i just freeze one 10 inch pizza dough all together? Hi! Yep, you can just freeze a whole 10-inch pizza dough. Perfect Recipe! Thanks for posting this I will deffinetly be using this recipe a lot! Just make sure to put something between the dough and pan cause this deffinetly really stuck to the pan I will be trying wax paper next time. Try using parchment paper!! Fabulous for everything! I made it on a pizza stone, just put a little bit of olive oil on the stone, and had no probs with it sticking whatsoever. Not wax paper. Try parchment paper. It is God’s gift to cooks. I just tried to hid a and it’s really great! But I was wondering how’s long can you store the dough in the fridge for making ahead? I just LOVE this. I forgot to get the thick tortillas for pizza and was looking for a quick pizza crust. Came upon this. My two daughters, 6 & 13, helped make this. I felt it was too hard to knead, unless my hands are just too weak 🙂 We did had to add at least another 1/2 cup of water and added onion powder, pepper, garlic powder (I just pour never measure) and 1 drop of Thyme Vitality Oil from Young Living. Making this again and will add a drop of Basil vitality oil. My husband, after eating it all, told me I done and messed up because we are no longer ordering pizza again. lol. I also plan on making ahead of time and freezing for those crazy days I do not want to take forever cooking. (Sorry, I am not trying to advertise for Young Living, just wanting to say what I added to my crust) Thank you so so much for this recipe. Just AWLFUL! I was excited to make it. I made it to the exact recipe. Didn’t work, like a brick. I made it a second time, added more water and oil. Still like a brick. Tasted like eating a hard dough. Not crispy. Just hard, flat brick. AWLFUL!! I am so sorry it didn’t work out for you! If you look at the previous comments, everyone has pretty much had a lot of success with it. Not sure why it didn’t turn out for you. Sometimes it could just be the baking powder if it’s not new or fresh. Other times it could be the altitude. Nonetheless, I’m very sorry you didn’t get to enjoy it. Let me tell you….is AMAZING!!! I love it and my kids too. My husband found your recipe for me, since I have a yeast allergy, and have been mourning the pizza-less life. I LOVED it! And I can now continue to eat pizza, pain and problem free! I added a Tbsp of honey, tsp of basil, and about 1/2 tsp of garlic powder, and it was great! Thanks for sharing your recipe! I did NOT like this recipe. What a shame – it is not pizza dough, it instead tastes like scones or damper! I cooked up a batch of 24, for a charity thing. Loaded it as much as could fit with fillings, and charged a charity donation for each one – then imagine my embarrassment to taste one and realise it tasted like a scone rather than pizza! Unfortunately not a fan of this one at all. Be warned before spending hours – don’t cook this one in bulk – try it first! I didn’t like it at all, and it’s not just me. Followed the recipe to a t too. Hi Mandy! I am so sorry you didn’t like it! I have never made this in bulk so I can’t really comment on why it didn’t work, but I am really sorry that you didn’t enjoy it. Haters? You’re crazy, Mandy wasn’t saying anything hateful, just how it worked out for her, possibly in hopes of getting a suggestive response, Mandy was very kind and tactful as well in her comment. You–Just rude, but maybe only ignorant if you were given the benefit of the doubt. Hi! just wondering if the recipe will still be the same if i use bread flour instead if all purpose flour? Cant wait to make! Thx in advance! Hi Nia! Not absolutely sure about that because Bread Flour is designed for yeasted baking, and since this dough does not use yeast, it might not be the best flour to use for this recipe. That doesn’t mean I wouldn’t try if Bread Flour is all I had, but I’m just not sure that it will work out as it should. Hi, would love to make this for dinner tonight. I wanted to know since my family is gluten free, I make my own gluten free flour blend using rice flour, potato starch and tapioca. Is there any way I can substitute this gluten free flour blend in place of the all purpose flour using your recipe? Looking forward to your reply. Thank you! Hi Tanya!! I can’t say for certain because I haven’t tried making it gluten free, but if it’s worked for other breads and doughs, I’d say to go for it. I personally made it using a cup of rice flour, and a cup and a half of garbanzo bean flour instead 9f all-purpose regular flour. It turned out amazing! Hi! That’s awesome and thank you for chiming in! I’m so excited to try this recipe! How big of a pizza does it make? Hi Elizabeth! I would say about 10-inches. I made a 12 inch with this receipe and it was about 1/2 inch thick before baking and almost an inch after. Hi, how long can the yeast free pizza dough last in the fridge in case I have leftovers or want to prepare in advance? First, make dough and then shape into individual dough balls; oil your hands with olive oil and wipe lightly around each dough ball. 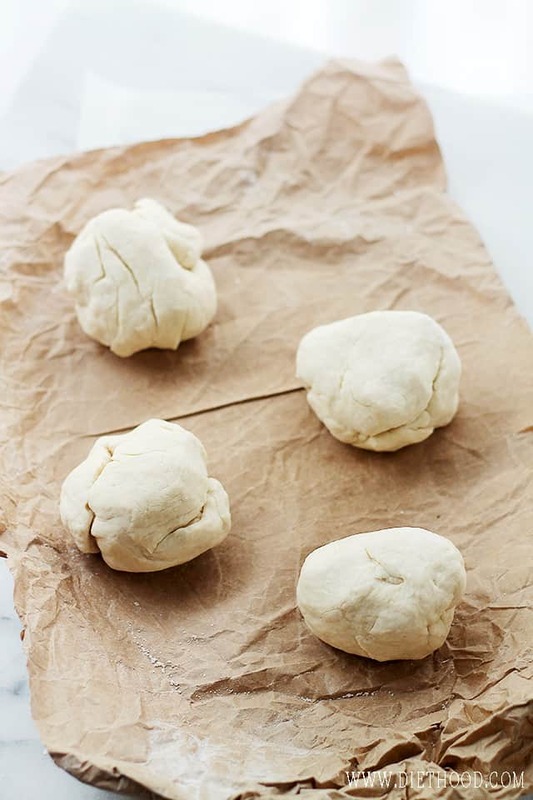 Place each dough ball into a separate freezer bag, squeeze out the air and seal. You can freeze it for up to 3 months. When ready to use, thaw it out completely. In as far as storing leftovers; let the pizza cool completely, place it in a resealable bag, and refrigerate. You can also leave the pizza on a dinner plate, cover it with saran wrap and pop it in the fridge. Hope this helps! Who needs to buy pizza again! This is yummy! Hello, I made this recipe today and I wanted to tell you my result. Th dough was thick, dense, bland, and didn’t have any brown color at all. I did exactly what the instructions said and I cannot figure out what I did except I feel like the 5 minute knead time might have made the dough tough in the end. It was not light, fluffy, or brown. What can I do to improve this?? Sometimes dough that is too dry (not enough water) will turn out dense and tough. 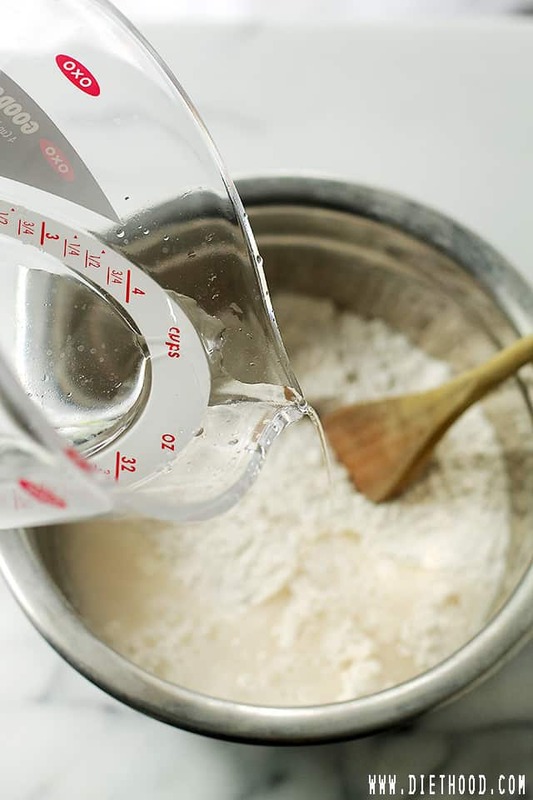 It’s very important that the dough is soft once you’ve mixed the water into the flour. It probably didn’t brown because it’s made with water? If you want a vegan crust still but for it to brown, you could try making with oat milk instead. Also try to add some seasonings like garlic powder in the dough and Italian seasoning before baking? Could also brush with olive oil before baking as well. I like the taste of it. You should bake the dough for about 8 minutes before adding the toppings; then, remove from oven, add your toppings, and then pop it back in for another 15 minutes, or until browned and cheese is melted. Hope you enjoy!! I was confused by this also, but prebaked based on experience. If possible you should edit the recipe to specify so people don’t have to scroll through all the comments and reviews to find out! Pizza is finishing baking now, hopefully I did it right! hi. cant wait to try this recipe. my husband and I LOVE pizza, but I have never used yeast before and am too intimidated too.. i wanted to ask if I could replace 1/2 of the all purpose flour with whole wheat flour? If yes, does anything else change? Thanks. Hi Pia! Yes, you absolutely can replace 1/2 of the all-purpose flour with whole wheat flour and you don’t have to change anything else. I hope you enjoy it! Is there a link to the recipe for the grilled bbq chicken pizza? or a how to for cooking a pizza outside of the oven/grilling? Hi Bailie! Thanks so much for pointing that out! The link should go directly to the recipe for the BBQ Chicken Pizza, but apparently it doesn’t! Thanks for letting me know! Quick question ; I’ve never cooked with yeast before , if I wanted to use this exact recipe , what alterations would I have to make/how much yeast , does anything else in the recipe change ?? Awww I wish I could post a picture!!! Impressed with the results!!! Loved the texture of the dough one kneaded , wasn’t tough or too soft . Perfect for when you have no yeast on hand . Absolutely loved it ! Txtd my friend a picture cus I was so happy and she texts back “can I have a slice ” lol thank you for the recipe!!!! In place of the canola oil, could I use a blend of canola and extra vigin olive oil? Hi Lori! Yes, you absolutely can. All I have to say is WOW!! This turned out to be one of the best pizzas I have ever had. First time making this and any pizza dough for that matter. I impressed myself lol and talk about aromatherapy. So I didnt end up using all of the water oil mixture and the dough once cooked seemed a little dense but I seasoned it so well that it got completely ignored. I wasnt sure if it was supposed to be that dense or what the texture was supposed to be like exactly but I also did it all by hand. Tried not to over work the dough but maybe next time it will turn out better. But I was still amazed at how good it all turned out. You dont even need meat. Do I bake the dough without toppings first, or does eveything go on the raw dough? Hi Jessica! Yes, you want to prebake the dough because if you don’t, you’ll end up with a doughy, not thoroughly baked crust. So, what you want to do is bake the dough for about 8 minutes, remove from oven, add your toppings, and then pop it back in for another 15 minutes, or until nicely browned and cheese is melted. Hi, not sure if this has been asked already but can I use coconut oil instead for an apple dessert pizza? If so how much should I use as its cold-pressed. Just made this pizza crust and I have to say it is amazing!!!! Thank you so much for the recipe, I have a yeast allergy so you can imagine how excited I am to find this recipe. If you have a yeast free bread recipe I love to hear about it! Thanks again!!!!! Hi Kristen!! I am SO happy to know that you loved the recipe! I can’t imagine having a food allergy – thank GOD I don’t – but I can only imagine how difficult it is to work around it. This recipe also works great if you wanna make it into cheesy breadsticks. I haven’t made a yeast-free bread, but now that you mention it, it’s on the bucket list! I was just thinking about what else I have on here that’s yeast-free and something that you could try – how about these 30-Minute Caramel Sweet Rolls! https://diethood44.wpengine.com/30-minute-caramel-sweet-rolls/ They are delish!! How do I store leftover pizza dough? Do I roll it first and then store in a zip lock bag or can I just store the dough balls? Also how long do these last in the fridge? Thanks a lot! Happy to know you enjoyed the pizza! That dough is quite perfect. To freeze the dough, shape into individual dough balls, oil your hands with olive oil and wipe lightly around each dough ball. Place each one into a separate freezer bag, squeeze out the air and seal. You can freeze it for up to 3 months. When ready to use, thaw it out completely. I used King Arthur gluten free multi purpose flour and this turned out great. It was the perfect combination of chewy on the inside, light crunch on the outside. My notoriously picky 12 year old liked it. That makes this recipe a keeper! Hi Tammy! Yes, you can use self-rising flour, but omit the baking powder and use only a pinch of salt. Could you use gluten free flour with this recipe? I honestly have no idea. I have never tried it with GF flour. I know I’ve seen recipes for GF pizza dough with a blend of GF flours, but I am definitely not an expert so I can’t offer any helpful advice. I’m sorry. 🙁 If you do try it with GF Flour, will you please come back and let me know if it worked out?? Is it possible to put this together with a stand mixer? Due to “lovely” arthritis, I can’t do much with my hands/wrists, but I’d really like to try this out. Thank you! I just put this in the oven. I can’t wait to eat it! Hope you have a great dinner!! Let me know how it goes! We loved this! I rolled it a little thinner and it still puffed quite a bit, but it did have a crispy bottom. (I used bread flour.) It wasn’t gooey with all the sauce, cheese, ham, pineapple, red bell peppers, and mushrooms I piled on. I’m making it again tonight in bread stick form and adding some garlic butter on top to eat with spaghetti. Thank you! So happy you enjoyed it, Sam!! Thank you! Great idea with the bread sticks! Hi, can i use olive oil instead of canola oil? Thanks! Hi Jey! Yes, you certainly can, but it will add flavor to the dough. If you make it, let me know how it goes! Have a great weekend!! Thank you very much for this recipe.. I made this tonight.. It was awesome.. But my crust wasn’t crispy.. Everything else is great.. 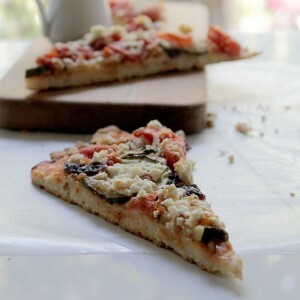 I was looking for yeast free pizza base because my boyfriend cannot eat anything with yeast due to gout.. Thia recipe is what im looking for..so thank you! Do u have any suggestion how i can make the crust crisoy next time? Thanks! Hi Jey! So glad you liked it!! It’s a delicious crust, indeed. Try using bread flour instead of all purpose flour. All purpose flour does make for a chewier crust, but bread flour should give you the crispy texture you’re looking for. Let me know how that goes! Such a good idea! When a pizza craving strikes, there’s no time to wait! Do you cook the dough a little before putting on the toppings or just top it and bake? If you’re going to bake it in the oven, then no, you don’t have to pre-bake it. You can if you want a bit more of a crunch to the dough, but it’s not necessary. The dough will bake fully together with the toppings. Thank you!! All recipes are different but top/bake is the basic idea. A hot oven and pizza stone is key too… (I’m at the experimental stage personally). After this I’m going to try a deep dish pizza. Dude you have mad skills. I love pizza as you know. We eat it way too much. I am intrigued by this and can’t wait to try it!! So eager to try this dough! And yes, I totally feel you on the husband complaints. I swear mine never just shuts up and eats lol. 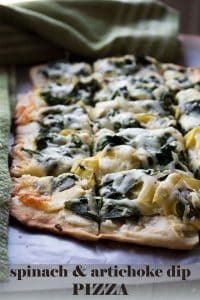 Yeast HATES me, so I’m absolutely making this recipe for pizza night on Friday! As much as I love the whole process of making yeast-risen pizza dough, sometimes you just need pizza pronto! I’ve thought about doing baking powder crust in the past but was worried it would be puffy not crisp. Is this one crunchy? The crust does puff up a good amount, but not to worry, there’s a crunch! 🙂 Give it a go – I think you’ll like it. Have a great day!! can I ask what is it about that? Wow! 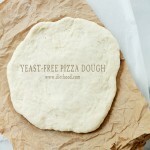 I never thought to make yeast free pizza dough, but this is perfect for someone like me who is short on time. I love this and can’t wait to try it! Mmmm…now I’m craving pizza!! Gimme! 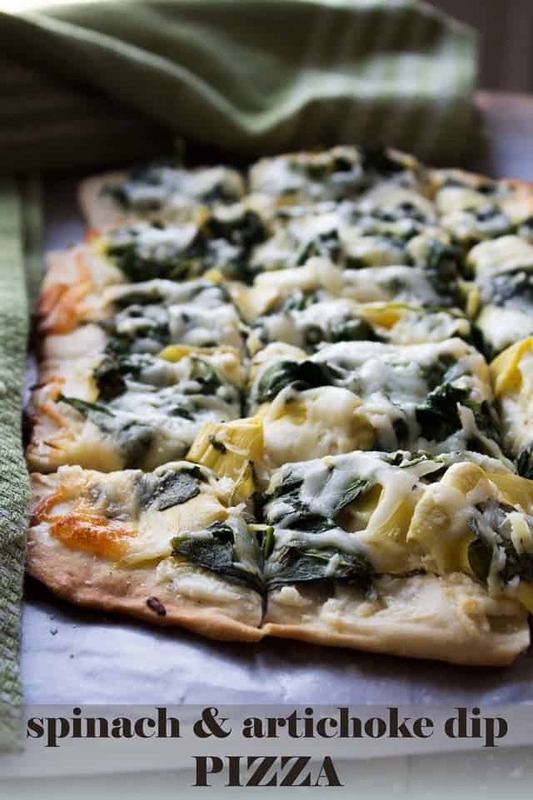 Yeast-free dough is just genius for weeknights! I just need to try this! 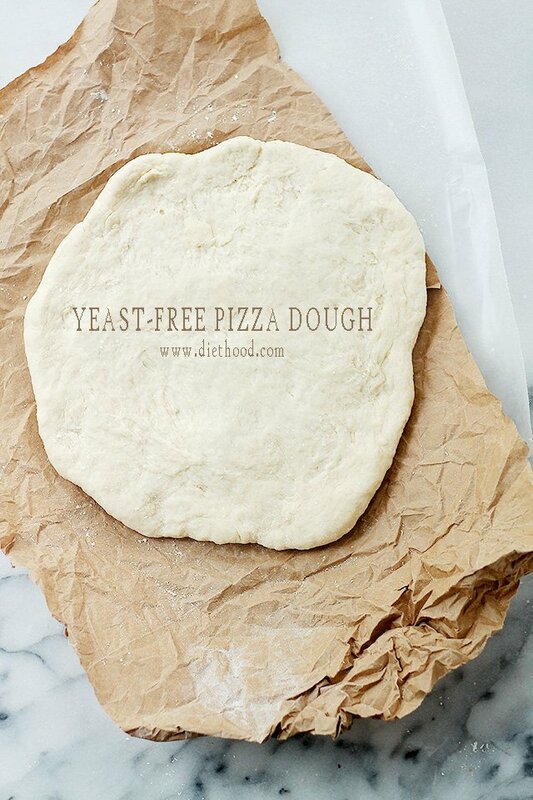 We make pizza once a week and I am totally intrigued by this yeast free version! Pinned! Glad you found something he found acceptable.